In the last edition of RSC NewsFeed we posted Farewell Lectures? 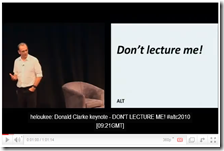 Donald Clark Stirs it Up which highlighted Donald Clark’s “Don’t lecture me” keynote from ALT-C 2010. In this post we directed you to a related post on the Learning Conversations blog which mentioned that there was a lot of backchannel dialogue during Donald’s presentation by delegates in the room and those remotely watching via Elluminate. The use of Twitter at educational conferences has really taken off in the last couple of years allowing an individual find a voice in a format which is usually dominated by whoever is standing at the front. The tweets from Twitter are potentially not only just a valuable historic record of the audience reaction but can potentially improve the navigation and searchability of video resources. This is explained in more detail in Martin Hawksey’s (RSC Scotland North & East) guest post on the FOTE website Making ripples in a big pond: Optimising FOTE10 videos with an iTitle Twitter track, in which he describes how and why he was able to combine conference videos with subtitles of the audiences tweets. The same technology has now been used with some of the video from ALT-C 2010. So you now can see what the audience ‘tweeted’ during Donald and Sugata Mitra’s keynotes.